Bouncing Berry is more than a cheese with a playful name - this classic Welsh cheddar is sure to be a hit during the holidays too! The Snowdonia Cheese Company, founded in 2001, set out to produce high-quality, locally produced products that could be enjoyed around the world. As a regional champion of the Welsh traditions it is based on, Snowdonia prides itself on their caring approach to each product they produce, and the methods in which they do so. 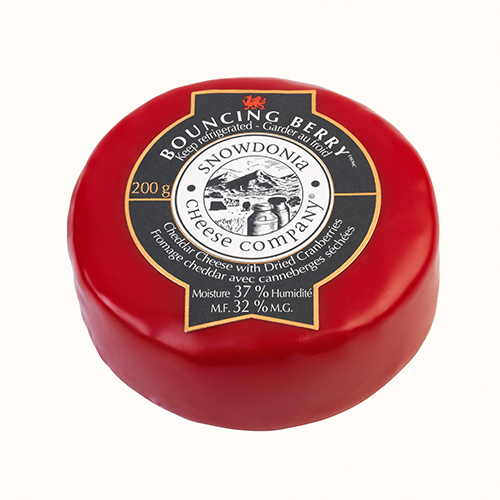 Snowdonia's Bouncing Berry Cheddar blends pure, traditional Welsh cheddar together with juicy, sweet and tangy cranberries for a truly remarkable marriage of flavor. This cheese is a classic cow's milk delight bursting with fruity flavor, making it one of Snowdonia's most tantalizing cheeses.